of Viyathmaga. 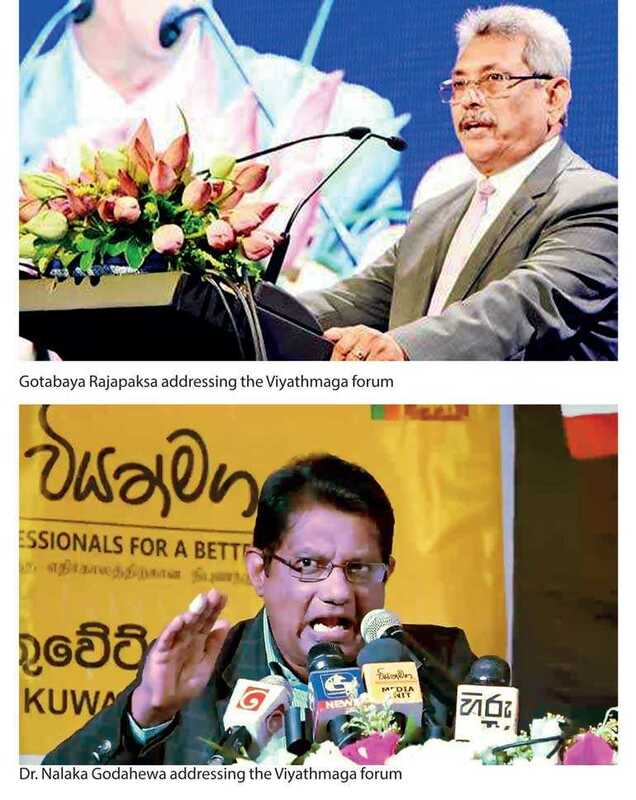 Speech made by Gotabaya Rajapaksa earned the attention of many and it was criticised by many. Both the speeches projected a continuation of the existing market economy and there were certain emphasises made such as continuation of the system with the focus of the people while safeguarding our sovereignty and cultural heritage which is true and no one can object to it. However there were contradictions as well of the two speeches. Rajapaksa was talking about establishing a Socialist Market Economy in Sri Lanka. Godahewa said that an economy practiced by one country cannot be implemented in another country and emphasised that we need an indigenous economic model. Rajapaksa said that the State investments in businesses should also bring profits. Godahewa while criticising the International Monetary Fund (IMF) said that they want to close down the loss making state institutions and it is not possible to develop the countries as recommended by IMF. In addition to that he said that IMF recommends to increase the Government Revenue and Reduce the Government expenditure; reduce the budget deficit; increase the taxes; allow to float the exchange rate and there are no such countries which were developed based on the recommendations of IMF. He mentioned the names of several Far East countries and according to him those countries were not developed based on the IMF recommendations. The term used by Rajapaksa, ‘Socialist Market Economy,’ was used to describe the economic reforms introduced by Deng Xiaoping in China. State institutions in China operates in a market economy. All the business entities under the communist regime were owned by the state. Market economy was introduced to China and these institutes started operating within the newly-introduced economy without the influence of the government. Profits generated was kept within such institutes. Now China is in the process of privatising those state institutions gradually. There is an ideology against such privatisations as well and according to them those institutions should continue to be under the purview of the communist party. The opinion of an expert of China (Yukon Huang – https://www.youtube.com/watch?v=XepCi0I_g6I) is that the corruption of China is beneficial to the Chinese economy. The reason is that the government officials are engaged in corrupt practices in the process of privatisation of the state institutions and the privatisation promotes the growth of the economy. More corruption means more privatisations and higher economic growth. Quite in contrast to this in India or any other country corruption occurs when the private sector needs to get certain things done by the public sector and this corruption is detrimental to the economic growth of the country. Therefore Chinese model cannot be used in any other country and not in Sri Lanka as well. There were certain comments exchanged in the print media about this socialist market economy. Politicians who were close to Rajapaksa pointed out responding to UNP politicians that Rajapaksa mentioned socialist market economy and it is quite different to the social market economy perceived to be adapted by the UNP. If Rajapaksa, who is aligned with China, used this term only in relation to the economy it reveals his limited knowledge of the said economic model. If he meant more control of the economy by the State sector, that is what China is trying to reverse and that is where we experience inefficient utilisation of invested capital. However his area of reference may not be limited to the economy alone. Maybe his intention is to drive the existing market economy especially the State institutions with an authoritative manner although not with a sole party as in China. This is the intention of the forces behind Rajapaksa as well as revealed by Asgiriya Anunayaka recently by his controversial comment. However this cannot be socialist market economy and it would be a dictatorial market economy. The idea presented by Godahewa that the economic model practiced by one country cannot be adapted by another country was a half-truth. The same economic model is used by different countries with certain modifications. However it is the truth in respect of China. Godahewa’s opinion about the IMF is not correct. Any economist cannot disagree with IMF in relation to the points mentioned by Godahewa. However the issue is that the way they present it to a sovereign country. During the Asian Economic Crisis in 1997 Malaysia did not accept the assistance of IMF mainly because of IMF imposed conditions to open up its financial markets before those are properly regulated and it would have negatively affected the Bhumiputra concept in Malaysia. Malaysia’s initial response to the crisis was referred to by many as an IMF package without the IMF. Thailand, South Korea and Indonesia accepted the package offered by IMF. Godahewa has spoken about exchange rate movement as well. He said that during the period of this government the rupee depreciated against the US Dollar by 19%. He said due to this depreciation government foreign debt increased by Rs. 886 Billion. This phenomenon is true and I hope the figures mentioned by him are correct. But this is a one-sided story. The policy adapted by the Governor Ajith Nivard Cabraal during the regime of Mahinda Rajapaksa was that to keep the exchange rate stable artificially by using the borrowed foreign funds. The intention was exactly the reason given by Godahewa since the former Governor also mentioned this point of increasing of the quantum of foreign debt due to the depreciation of the rupee. By keeping the rupee stable the country can control the imported inflation in addition to the point mentioned by Godahewa since Sri Lanka is heavily depended on certain imports. However by adopting an artificial methodology to keep the exchange rate stable there would be a severe impact of the exports of the country. That was what exactly happened. Exports of a country cannot be solely managed by the exchange rate since it is only one factor promoting the exports. However it is a vital factor in two ways. Exporters of the country cannot simply increase their prices and their prices are depending on the prices quoted by the competitors as well. If the domestic prices including the interest rates increase, one way to mitigate that is the depreciation of Rupee in the point of view of the exporters. Also if the domestic currencies of the countries of the competitors depreciate at a rate more than the Sri Lankan Rupee our exporters would be in a disadvantageous position. During the previous regime, 2006-2014 depreciation of the rupee was very low. However in two instances they could not manage it at all and the rupee depreciated very rapidly. In the first instance the rupee depreciated by 5% within three months from September 2006 to December 2006. In 2012 from January to March the rupee was depreciated by 12%. This policy contributed to the decline of exports during the previous regime. Export of Goods and Services as a percentage of Gross Domestic Product was decreased from 30.13% in 2004 to 21.09% in 2014. This Government also was not able to improve this considerably so far. In the table the information of USD/LKR exchange rate and the export of goods and services as a percentage of GDP from 1991 to 2017 is given so that the correlation between the depreciation of the rupee and export to GDP is visible. Managing an economy is a delicate act of balancing since all the factors are inter-related. Therefore one cannot apply a hard and fact rule in any particular area. Stable exchange rate is beneficial in certain areas but not beneficial in other areas. Managing exchange rate by artificial means is detrimental to the economy. When talking about the economy of the country, especially by politicians, there are lots of misrepresentations and baseless allegations. However I thought that Viyathmaga as its name denotes should have given a more realistic view of the economy of the country but it was proved that I was wrong.